Giving Nature a Home in Northern Ireland Happy International Bog Day! To mark International Bog Day (July 22), we hear from our three RSPB NI Co-operation Across Borders for Biodiversity (CABB) project officers. CABB is a five-year European-funded conservation project that spans Northern Ireland, the Republic of Ireland and Scotland and will improve habitats for birds, butterflies and other species, restore blanket bog and help produce drinking water at a lower cost. We don’t normally think of bogs as habitats rich in wildlife. Boglands and peatlands have in the past been described as ‘wastelands devoid of life’. I of course disagree. Apart from the benefits bogs provide as a carbon store, providing our drinking water and natural flood management, they are also rich in biodiversity. Peatlands are dominated by sphagnum mosses and these decompose over years to create peat. Our peatlands cover 14% of the land surface in Northern Ireland. Pettigoe Plateau is an area of blanket bog in County Fermanagh that borders with County Donegal. It is the second largest blanket bog site, and the only extensive area of lowland blanket bog, in Northern Ireland. It supports a wide range of interesting plant and invertebrate species and there is always something to spot when walking over the bog surface. If you keep your eyes peeled you cannot escape the birds that call the bog their home. The call of the skylark can be a constant accompaniment during the spring and summer months, while you will also see meadow pipits flying between patches of heather. Snipe and red grouse also inhabit the bog. The iconic hen harrier is a treat to see as it swoops down hunting for prey. If you visit the Pettigoe site in winter you may have the pleasure of seeing Greenland white-fronted geese which visit Fermanagh every year. The CABB project is ensuring our bog habitats are managed properly so that the species that call it home can flourish. Bogs really are special places. My work is on a cut-over lowland bog - Montiaghs Moss SAC in Co Antrim, not far from RSPB NI's Portmore Lough reserve. Because of historic peat cutting a system of pools has been created which are perfect for aquatic plants, water beetles and dragonflies. When I walk across the Montiaghs during the summer months dragonflies and damselflies are in their element. 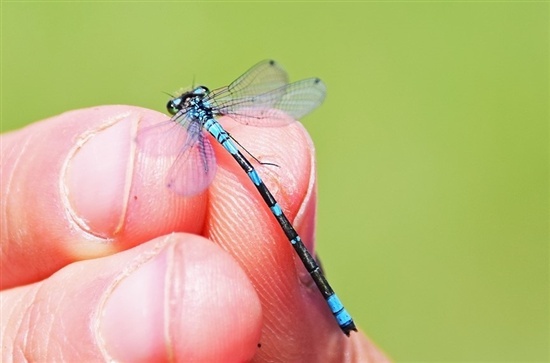 Montiaghs is home to 13 species of dragonflies and damselflies but supports one rarity: the Irish Damselfly. It is found in Northern Ireland and the Republic but not in Britain. The life cycle of dragonflies and damselflies is fascinating as they spend most of their life under water as an aquatic larva. Females will lay their eggs on stems of aquatic plants which will hatch into larvae a few weeks later. The adult stage is the shortest stage in the life cycle, as they only fly for a couple of weeks. I’ve been busy surveying throughout Montiaghs Moss to find out where the Irish damselfly are breeding. By knowing what conditions the Irish damselfly prefers will allow us to create more habitat so the species can thrive. Constructing peat dams on the Garron Plateau is vital for sphagnum mosses to survive. These little plants are big players in creating and maintaining an active (peat-creating) bog. Sphagnums are the bog engineers, playing an enormous and vital role in winning the battle against excess carbon in our atmosphere, which leads to global warming. Over vast areas, these rainbow-coloured, specialist mosses take in carbon from the atmosphere, through photosynthesis, and create long-term carbon storage in peat, as their leaves and stems decay. Drains had been constructed on peatlands in an attempt to remove water and to improve grazing. But these dried the bog, causing peat to be exposed and released into the atmosphere and detrimentally affecting the water quality of rivers, loughs and drinking water reservoirs. Besides peat – plastic, wood, stone and heather bales can also be used to block these drains. Anything that reduces or stops water loss from this globally rare habitat. Raising the water table back to the surface allows sphagnums to reclaim their rightful place. By supporting the sphagnums, all the other specialist peatland flora and fauna species benefit, from carnivorous sundews to iconic upland birds such as curlews. The Co-operation Across Borders for Biodiversity (CABB) project is supported by the European Union’s INTERREG VA Programme and is managed by the Special EU Programmes Body (SEUPB).